Clinton and Trump faced off for the final time in Las Vegas. Hillary Clinton and Donald Trump faced off for the last time this presidential election cycle, and the candidates were clearly primed for the fight. The Republican and Democratic presidential contenders took the stage at the University of Nevada in Las Vegas for their third and final debate, less than three weeks before voters will head to the polls across the country. At the top of the debate, the candidates were asked about an issue that could not divide them more: abortion. The moderator, Fox News’ Chris Wallace, asked Trump if he would want the Supreme Court to overturn Roe v. Wade, pressing him several times. Wallace then asked both candidates about late-term abortions, noting Clinton voted against a ban when she was in the Senate. 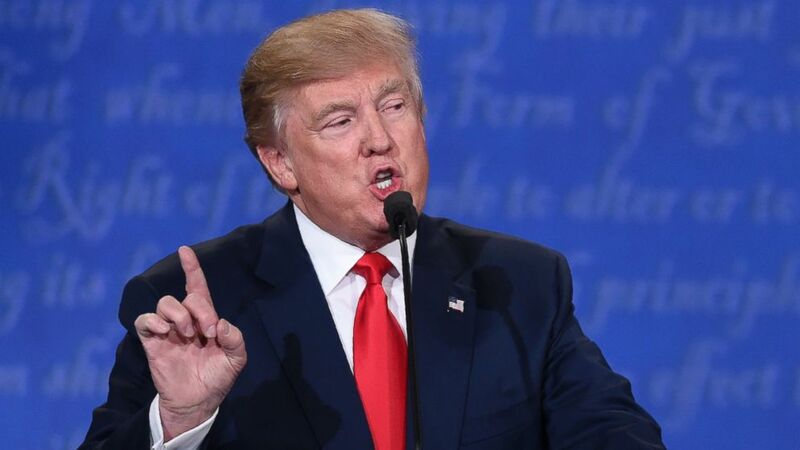 Trump then answered, saying, “I think it’s terrible if you go with what Hillary is saying in the ninth month you can take the baby and rip the baby out of the womb of the mother just prior to the birth of the baby. According to the Guttmacher Institute, a research and policy organization dedicated to advancing sexual and reproductive health and rights, late-term abortions account for only a very small percentage of abortions overall. “One of my first acts will be to get all of the drug lords, all of the bad ones, we have some bad, bad people in this country that have to go out,” Trump said. “We’re going to get them out, secure the border, and once the border is secured at a later date we’ll make a determination as to the rest,” continued Trump, who seemed to be referring to undocumented immigrants who haven’t committed crimes. (Saul Loeb/AFP/Getty Images) US Republican presidential candidate Donald Trump speaks during the final presidential debate at the Thomas & Mack Center on the campus of the University of Las Vegas in Las Vegas, Nevada on October 19, 2016. 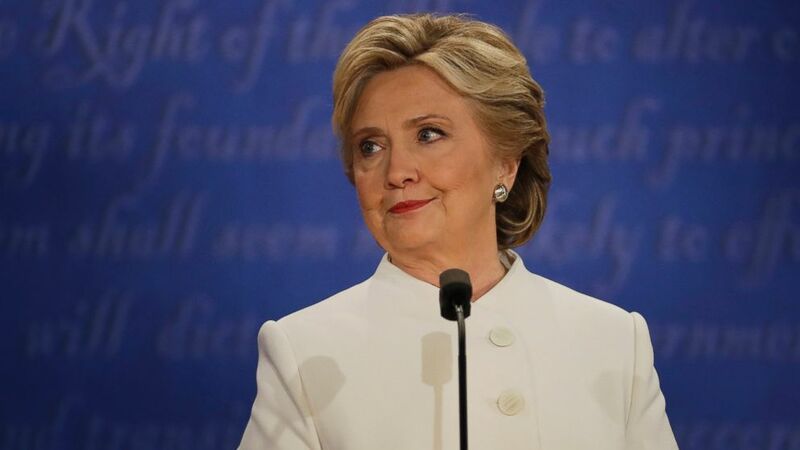 A question that started by asking what Clinton said during one of her paid speeches for a bank ended up turning into a debate over how close Trump is with Russian President Vladimir Putin and whether or not Russia is behind the recent leaks of emails from the Clinton campaign. “I never met Putin. This is not my best friend. But if the United States got along with Russia, wouldn’t be so bad,” he said. Clinton quickly jumped on the remark, attempting to turn it around on Trump. 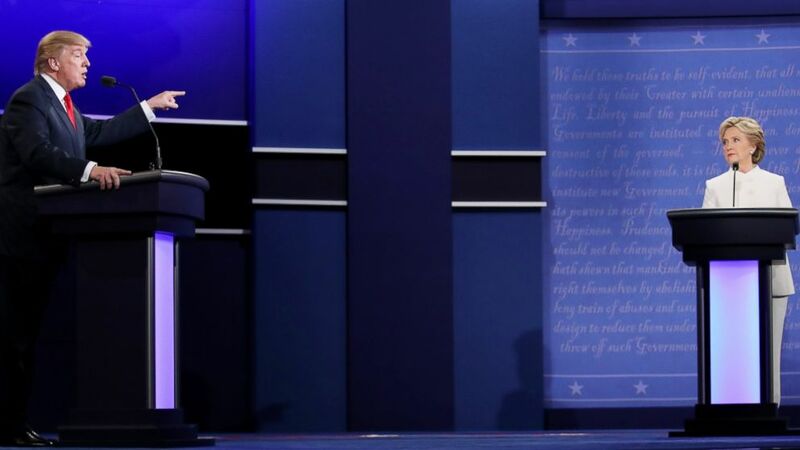 “Give me a break,” Trump then interrupted, but Clinton continued. “And on the day when I was in the Situation Room, monitoring the raid that brought Osama bin Laden to justice, he was hosting ‘The Celebrity Apprentice,’” she said. (Patrick Semansky/AP Photo) Democratic presidential nominee Hillary Clinton listens to Republican presidential nominee Donald Trump during the third presidential debate at UNLV in Las Vegas,Oct. 19, 2016. As he has on the campaign trail this past week, Trump again denied accusations of sexual assault made by multiple women since the last debate, saying they were all fiction. “Those stories have been largely debunked. Those people, I don’t know those people. I have a feeling how they came. I believe it was her campaign that did it,” he said. The women in question range from a woman who says Trump groped her while on a plane decades ago to a People magazine reporter who said Trump pushed up against a wall at his Mar-a-Lago estate in 2005 and forcibly kissed her. Trump has denied these claims. Clinton said “there is no evidence” that the Clinton Foundation used a pay-to-play scheme to provide favors to foundation donors while she was secretary of state. However, emails show top Clinton Foundation officials asking a senior State Department official to give special attention to “friends of Bill Clinton” after the 2010 Haiti earthquake. “It’s a criminal enterprise,” Trump said of his opponent’s charity. Trump then went on to slam the Clinton Foundation for accepting donations from foreign countries such as Saudi Arabia and Qatar. “So I’d like to ask you right now, why don’t you give back the money that you have taken from certain countries that treat certain groups of people so horribly? Why don’t you give back the money?” Trump asked. (Drew Angerer/Getty Images) Republican presidential nominee Donald Trump speaks as Democratic presidential nominee Hillary Clinton looks on during the third U.S. presidential debate at the Thomas & Mack Center in Las Vegas, Oct. 19, 2016. Trump declined to say tonight whether he would accept the result of the election on Nov. 8 as legitimate. Trump has alleged, without specific evidence, that voter fraud could tip the scales of the contest in November, but his running mate Mike Pence and daughter Ivanka Trump have both said they will accept the result of the election. For decades, defeated presidential candidates have conceded the presidential election after votes are certified to help ensure a smooth transition of power.